Recently, I had a meeting with corporate leaders at the Aberdeen Group, a company that conducts primary research studies. The discussion was about Social Media/Mobile/Cloud Computing technologies—SoMoClo™. In my opinion, it’s the next education IT movement. What they do best is “take a large community of like-minded individuals… bring them together at an educational event… where they have an opportunity to connect… to solve problems through technology,” says Andrew Borg, Senior Research Analyst at Aberdeen. The Aberdeen Group is now looking to partner with the education community. Hearing and seeing new ideas, connecting the education dots, and then reporting in an understandable way makes my day. A few years ago, I remember talking the ears off a couple of corporate guys at one of the education conferences about Cloud, kids and education. I don’t think they had made the connection, yet, so as a digital chalk pusher, it felt good to see the lights go on. And as the conference lights went out, we were still talking, but even as they closed the place down around us, I knew the ideas planted would grow. Today, you find the words education and cloud in the same sentences a lot. I think SoMoClo will be the same. For the longest time, anyone with an online product thought it was Cloud, but the reality is that the solution is much more than a marketing gimmick. It often depresses me when I hear some brilliant tech voices talk down Consumer Cloud as being too slow, and too difficult, and wouldn’t it be better to have everything on a local machine—comfortably—just the way we’ve enjoyed it… forever. And, after all, isn’t that “Cloud Stuff” just too expensive? I just don’t get that kind of talk, especially from people, who should know better. Evidently, that kind of argument has missed the boat, and it does more damage than good, especially if education ears overhear it. The bottom line is that Cloud naysayers don’t know education, and have no clue about its needs and budgetary constraints when it comes to delivering useful and affordable IT solutions to educators and students. These same negative thinkers are also driving wedges into Bring Your Own Technology (BYOT) ideas, because again, they are not educators. That is why we, as educators, need to actively participate. I believe SoMoClo may be a way to help launch an education movement from an education tech base rather than from a consumer and corporate one. And when I speak of education, here, I’m talking higher education as well. A first step might be to do some Twitter lurking at #SoMoClo. Why SoMoClo? Well, that’s easy. Most educators are already doing some of what SoMoClo stands for—Social Media, Mobile, and Cloud. Most educators are doing things online, or gathering resources there, looking to increase mobile use, and interacting with social media with Twitter or Facebook, as well as with their personal learning networks (PLN). What the SoMoClo movement could do for education, and for the population in general, would be to connect all the parts that are now seen as separate pieces. There are cloud, mobile and social media education leaders out there already. Imagine the impact if education leaders, with their followers, gathered under one banner that encompassed all of what the future of IT in education could be… should be. How can this SoMoClo movement begin? I think that may be easy as well. 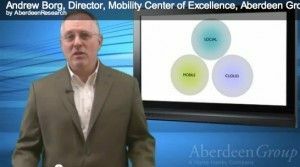 District leaders, university administrators, and educators interested in Cloud, Mobile, or Bring Your Own Technology programs (BYOT) should get involved with the Aberdeen Group’s agnostic SoMoClo research, as well as possibly becoming an education advisor. Believe me, education IT CTOs, Superintendents, and Higher Education Administrators, along with their teaching staffs, and students have the need and know how to change the way we look at delivering IT, and delivering learning for educators and to digital learners. Quite possibly, classrooms will become digital learning studios far sooner than I ever imagined. Aberdeen is an independent research firm that collects, analyzes, and writes unbiased fact-based research designed to educate researchers to help make the right technology choices. They do this through publications and online access to their community members. Check out the Aberdeen Group online, where you can read some interesting posts, as well as get a taste of some of the research they do. While much of that is geared to the corporate tech side at this point, Aberdeen is passionate about education, and is enthusiastic about partnerships with district and higher education IT and administration at districts and universities. At the site: you can contact them for more information, and a way to participate. If you’re determined in your efforts to forward education social media, BYOT, Cloud, Mobile, and technology as a whole, please share Aberdeen with your colleagues.